Here’s a demo of capacitive proximity sensing on the TI Launchpad. I’m hoping to use this in a project I’m planning. The circuit (below), uses a 1M resistor and (optionally) a small (<100pF) capacitor connected between ground and a port pin (P1.7). The tin-foil acts as a capacitor. When your body comes near or into contact, the capacitance increases. If your Launchpad isn’t grounded (ie. running from battery power), add a second foil to ground and move your hand between them. I’ve found that when using a small capacitor alongside the foil I see less background noise. By charging the capacitor then timing the discharge with a known resistance, we can determine the capacitance. Several cycles are shown on the trace below. To charge the capacitor, a port pin is driven high (set to an output and set high). A timer is then started and the pin is set to an input with an interupt enabled to detect a high to low edge. 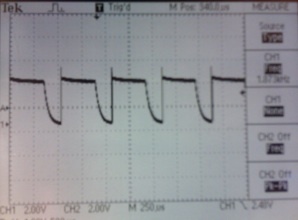 The capacitor discharges via the 1M resistor. Once the voltage drops below the input threshold for the pin, the timer is stopped. Once a touch is detected, the onboard LED is lit. It’s then turned off a short time later by the tick.